After thawing, the freshness is kept as it is, and the loss due to oxidation deterioration is reduced, and the working efficiency is also improved to reduce the cost. While reducing the outflow of umami ingredients and maintaining the original taste of the material for a long time, umami improvement due to the aging effect can also be expected. The reduction of preservatives, etc., as well as the improvement of hygiene due to the reduction of drips and the growth of microorganisms, brings about safety and security. 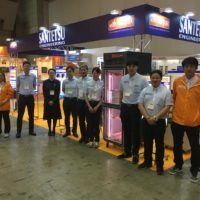 Introduction of the SANTETSU Engineering products. Copyright© SANTETSU ENGINEERING Inc. 2017 All Rights Reserved.